First up, asbestos removal. If you are reading this you are likely a musician, or perhaps, even worse, a musician and an audio engineer / producer like me. Listen up, quit what you are doing right now and get into asbestos removal. I would be quite surprised to find another line of work that seemingly takes so little skill, but pays so well. Our asbestos removal cost $14k, and took, wait for it, one and a half days. Now, I know, they need special suits and fans and stuff (oddly, ours never had any special suits or fans), and you do have to take the materials to a special dump or something that is expensive, but honestly, $14k?! Next, the driveway up front was taken out - we need to run new underground power lines, new water line and get fiber to the house and new building because now they come from the back of the house where things are going to get torn up. The day before the duplex demolition we took the kids over and let them fulfill the dream they had been talking about for months - they got to beat on things with hammers / bats / axes, and spray paint anything they wanted. On my way out of the studio that night a friend showed up. He and I had talked before about the fact that when he was born, his mom and dad brought him home from the hospital to one side of that duplex where they lived at the time. He asked if he could go have a look around and take some pictures and I told him to have at it and headed home. The next morning I showed up and saw that the work on the duplex had already begun. So I suppose we would have to say that this was really the beginning of the demolition. Incidentally, we found the missing Ford badge in the rubble pile. The demo, at least thus far, has gone well. The addition on the house was set to be taken down as well, but first the electrical must be moved. That is turning out to be a bigger problem than anticipated. The electricians dug the trench, got the new lines run as well as the new meter and panels, and the city came out and everything passed inspection. 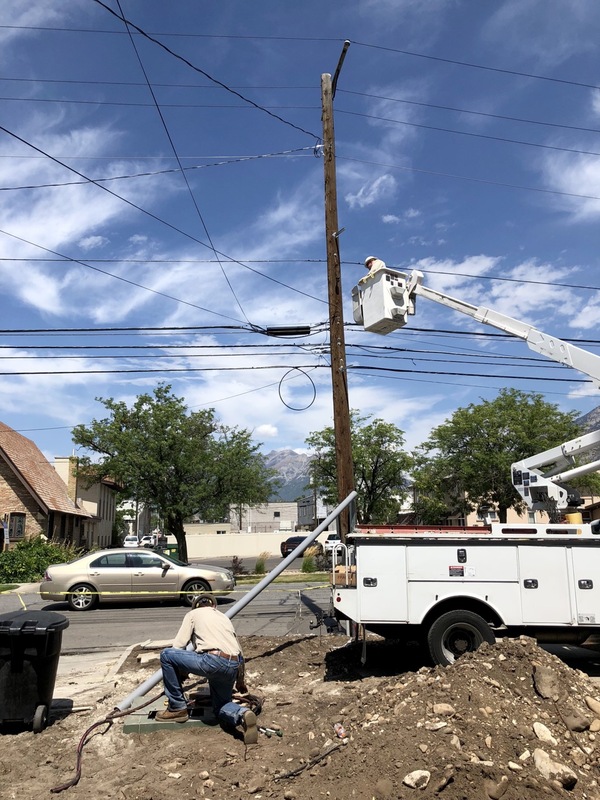 The next day Provo City Power showed up to hook us up and place the new transformer. Unfortunately, when they were going to place the meter it became clear that the city was preparing us for single phase power, while the plans and all the work that had been done, as well as the other equipment which had been ordered were 3 phase power. Honestly, I really don't even know what that means, but its clear that it's not good and we are now in limbo as we try to figure out where someone screwed up and what the best way forward is. Needless to say this will cost both time and money. I'm smart enough to know that I should just go ahead and settle in for a good 12 more months of that!